This table shows that, for travelers who accumulate at least 1 million loyalty-program mileage points Delta offers the ultimate prize: lifetime top-tier status at 4 million â€œflownâ€ miles. But the best reward is probably with United, where a million â€œflownâ€ miles earns Premier Executive status. Some U.S. airlines have special mileage-point bonus programs for only their most elite frequent flyers-- the travelers who reach 1 million mileage points or more. Achieving elitestatus in airline frequent-flyer programs takes a lot of travel: an annualminimum of five coast-to-coast round-trips (or equivalent) for the bottom rungof the elite status ladder, up to 50,000 miles for middle-tier membership and 75,000to 100,000 miles for hardest-to-hit top tier. To maintainthis hard-earned status means flying the same number of miles year after year. Whenfrequent travelers finally retire they usually don?t mind traveling lessfrequently but when they do make a trip they crave their customary perks. For them goodnews! Some airlines now give special treatment to members who accumulate 1million miles or more. These unpublished programs reward over 250,000 top travelersat American Airlines, Delta Air Lines and United Airlines with complimentary lifetime privileges. Theseprivileges include free upgrades to first or business class, bonus miles,priority seat selection and boarding, separate security lines and special reservationphone numbers. As with thestandard frequent flyer programs, benefits and qualification vary from airlineto airline, particularly when it comes to complimentary upgrades. Americanmakes it easiest to become a million miler because miles from any activity --including partner credit card spending -- count towards the threshold. Deltaoffers the ultimate prize of lifetime top-tier status at 4 million ?flown?miles, but the best reward is probably with United, where a million ?flown?miles earns Premier Executive status: this mid-tier membership usually requires10 transcontinental roundtrips every year. 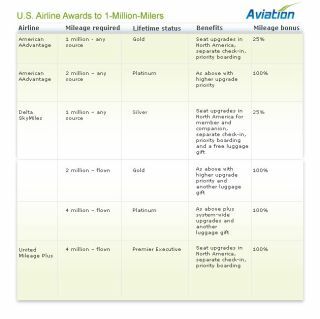 The tablethat accompanies this article details the status levels and benefits that American, Delta and United awardtravelers who accumulate 1 million mileage points or more and how the pointsmust be earned.